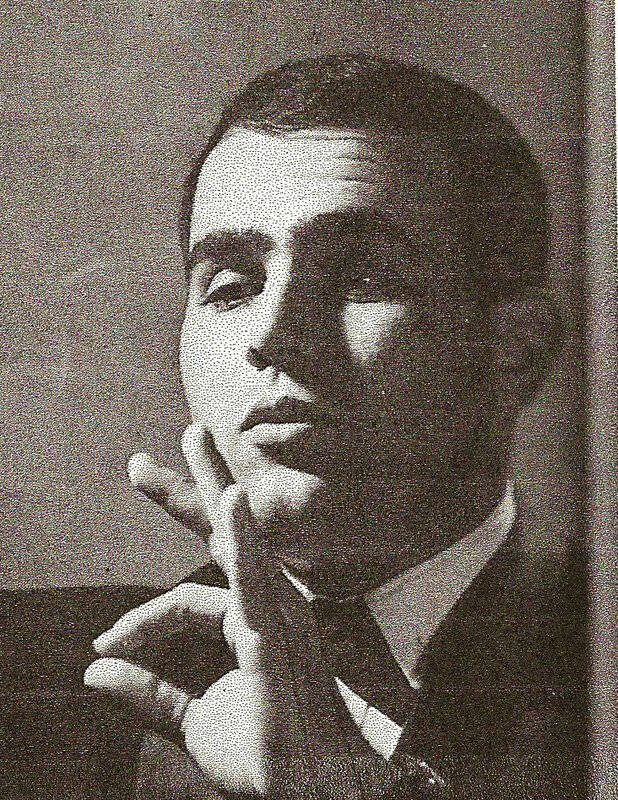 September 1966. Mr. Scott Henderson began his first year of teaching as the new vocal music teacher at Adolfo Camarillo High School. Mr. Raba had retired from teaching at the end of the previous school year. When I first heard we were going to have a new teacher I was very annoyed. I liked the old one well enough and was nervous about starting over with someone new. The first day of our sophomore year of high school I walked up to the new teacher standing nervously at the music room door and said, “Hi. My name is Trudy. You don’t know me now, but you will.” Prophetic, positively prophetic. We got two new music teachers that year; one for band classes and one for vocal music. Carol remembers walking up to the two teachers, who stood side by side chatting at the door of the music room and asking, “Which one of you is Mr. Henderson?” (Orbie Ingersoll was the other one). 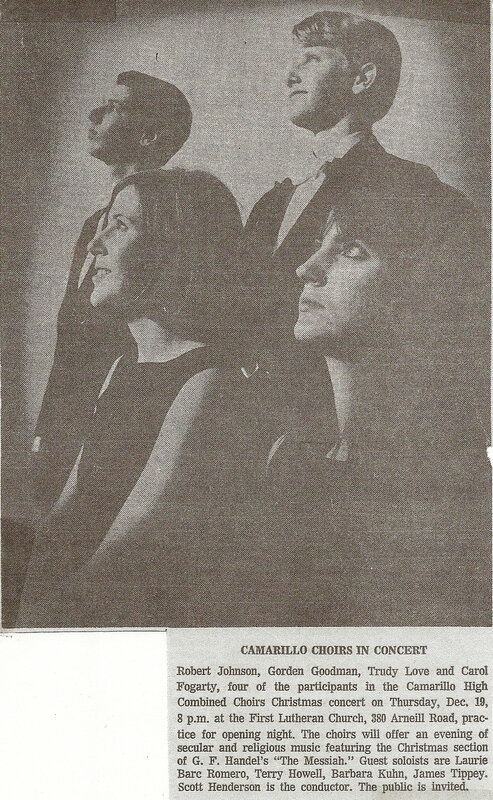 Mr. Henderson identified himself and Carol announced that she was quitting Girls Ensemble. She had been accepted into the drill team and felt that she could not be involved in that extra-curricular activity as well as music. Mr. Henderson asked her if -30 years from then – she would be in the shower singing or marching? With that compelling argument he talked her into staying in music. Mr. Henderson was an excellent music teacher. He made class fun, while at the same time challenging every student in every class to give much more than the previous music teacher had demanded. Who knew singing could be hard? 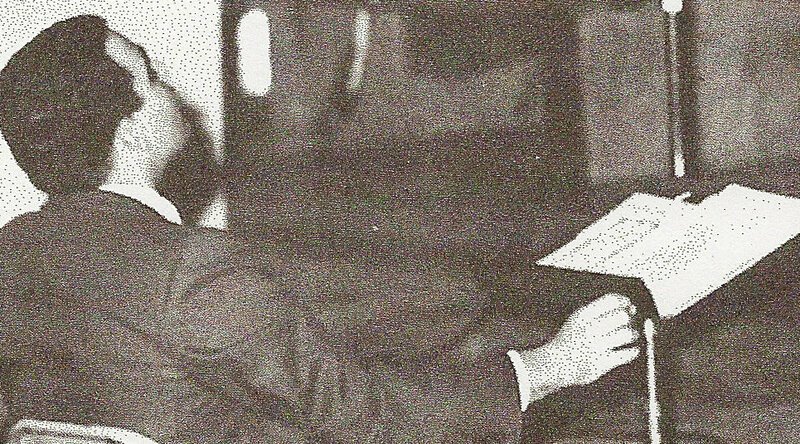 There were vocal exercises (BORING) and breathing techniques to learn and practice. We had to repeat lines over and over again until our pitch and blend were perfect. The extra work resulted in better music. He introduced us to wonderful music: Handel’s Messiah, Drum Taps, Song of Democracy, Carmina Burana. 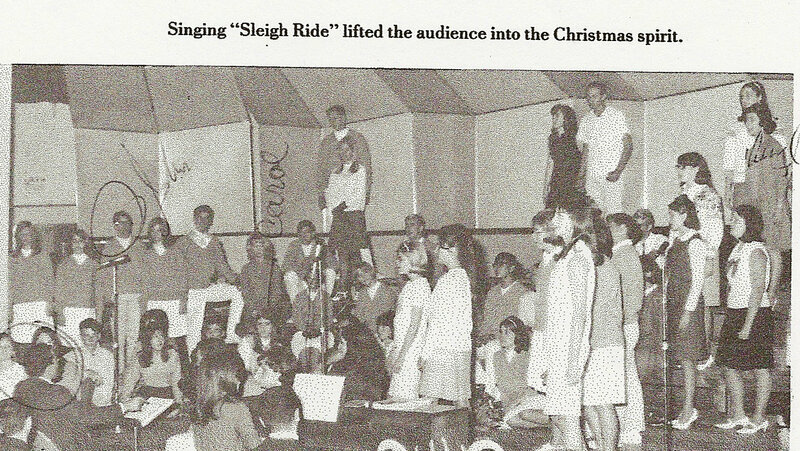 For the first time in I don’t know how long, when we performed at the high school Christmas assembly, not only did the audience not throw pennies, they actually applauded. They actually liked us! It probably helped that we were doing new and surpising things for an ACHS choir. Actually, adding movement – rudimentary choreography – and smiling during upbeat songs. I’m not sure the audience had seen anything like that during a concert in the past! He informed us early on that we should all expect to sing solos for the class on Fridays. the groan that went up was audible. But he didn’t back down. And he was as good as his word, warning us mid-week to be prepared with our solos, and asking, “Who wants to go first?” when we reluctantly sat down in our places Friday in class. When nobody responded he would pick some unlucky, insecure student to start us off with the first, quiet, shaky solo. Eventually, I figured out that it was a good idea to volunteer to be first. That way, once it was over, you could relax while everyone else was still nervous, anticipating their turns with sweaty palms. But he always eventually made his way around the class and we each had multiple turns at having to stand up, walk over to place our sheet music in front of the long-suffering accompanist at the piano, face our fellow students and friends, and give it our best shot. There was no limit on the style of music we could sing, so we usually picked popular or “standard” songs that weren’t too hard, that we could find sheet music for, and that we could sing with relative ease. We would swap our sheet music with each other from week to week, especially if the songs fell within our vocal range. Some of the songs passed through becoming familiar and went straight to being annoying. Songs I remember singing – and hearing, ad nauseum – were Autumn Leaves, Ebb Tide, That’s All, Girl from Ipanema, Misty, and My Favorite Things, among others. Of course there was always the possibility you could escape this torture so I wouldn’t volunteer to go first every week. There was only enough time in our 50 minute class to accommodate nine or ten solos. And if you were lucky and managed to be invisible enough you might be off the hook entirely for another week, at least. Mr. Henderson introduced us to all kinds of music. As a choir we sang classic choral works of the Great Composers. We learned modern pieces that were at first hard on our ears, as well as hard to learn; songs with a lot of dissonance. We sang sacred music as well as secular; music by Mozart, Handel, Delo Joio, Thompson, Hansen; music that gave me goose bumbs and nearly brought me to tears because it was so beautiful. We combined voices with other choirs, at music festivals and in combined choir concerts. We were especially happy when we got to sing modern, popular songs – even Beatle songs, like Michelle. 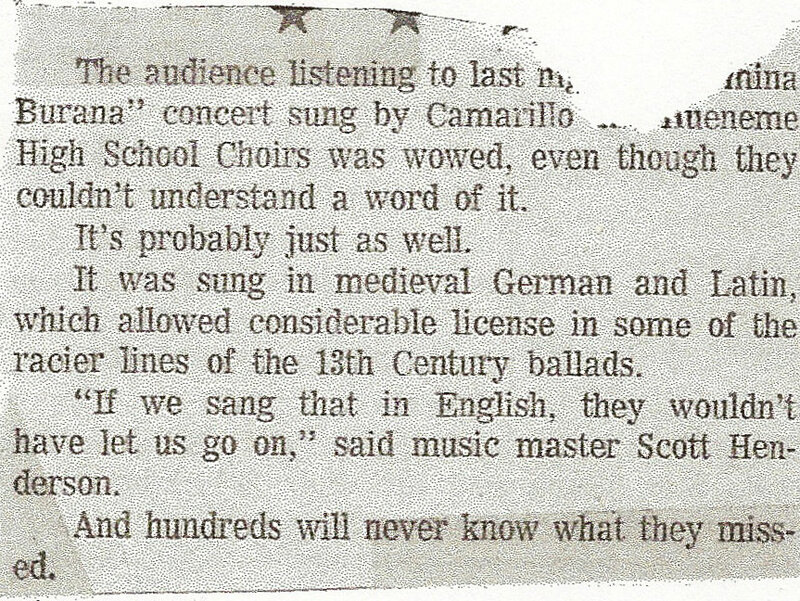 We even sang naughty songs – although neither we, nor the audience, knew what we were singing since the piece – the famous Carmina Burana by Carl Orff – was all in medieval German and Latin. To this day, some of my favorite Christmas memories are of singing in the choir at concerts where we did portions of Handel’s Messiah, and other great and classic Christmas pieces. 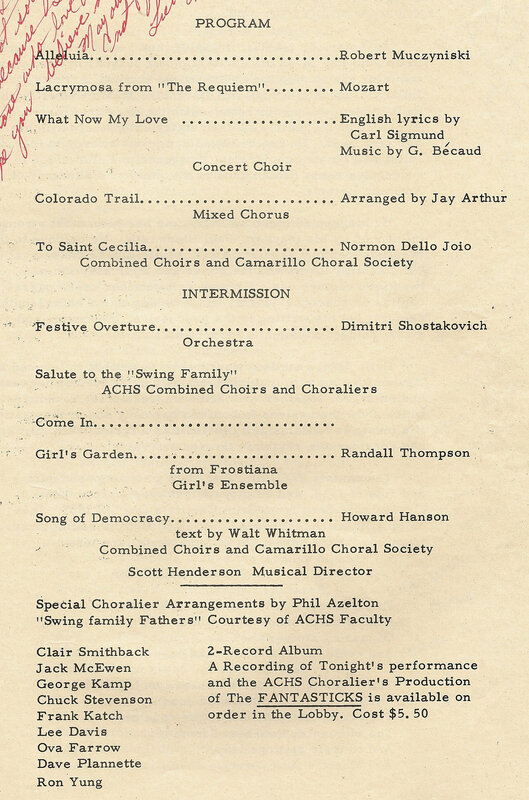 We were so privileged to have guest soloists at these concerts such as James Tippey (who was a singer with the San Francisco Opera and had done a command performance for President Kennedy) and Terry Howell (who was a member of the Roger Wagner Chorale and sang on the Paint Your Wagon soundtrack). Fresh out of college himself and coming from a musical family, Mr. Henderson had big plans and big dreams. He was appalled at the lack of culture in our little town, and made it a one-man campaign to not only ‘shape up’ our high school musically but to bring music into Camarillo – and even Ventura County – in a big way. 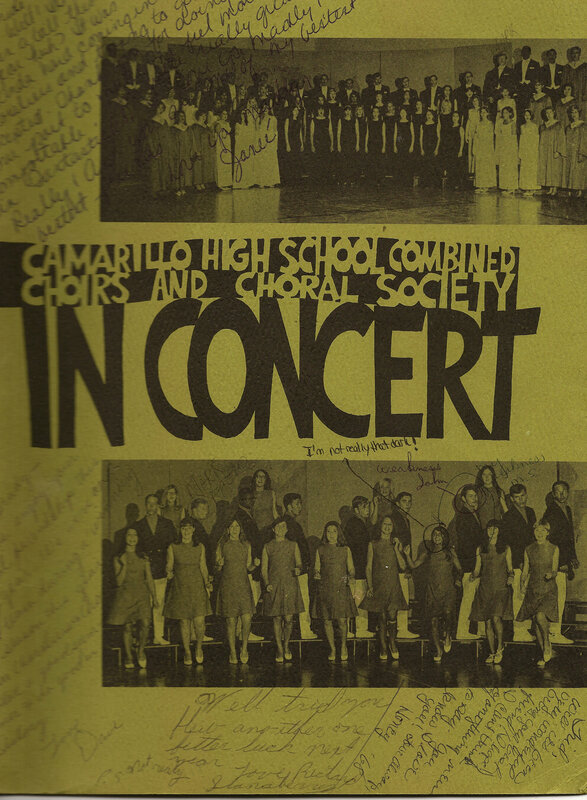 First item on the agenda was to form the Camarillo Choral Society. But that was only the beginning…. 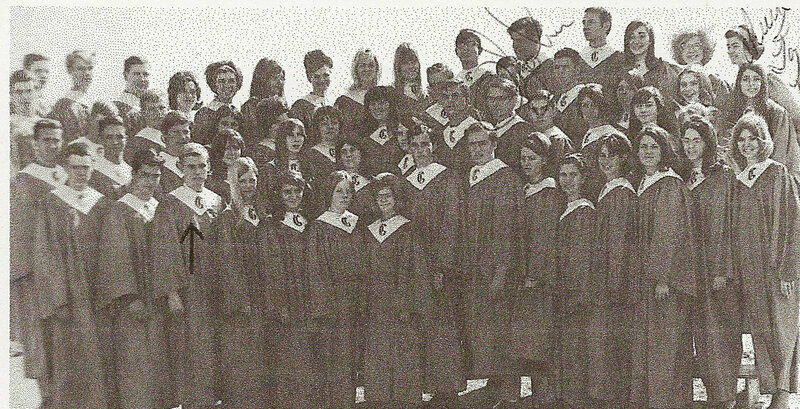 Within five years – in addition to being the vocal music teacher at Adolfo Camarillo High School and director of Camarillo Choral Society – Mr. Henderson formed and directed the Choraliers, the Today Generation, The Ventura County Master Chorale, The Ventura County Music Association, and the Scott Henderson Singers. He became the chairman of the Music Department at Camarillo High School and also the Oxnard Union High School District. He also directed West Side Story, The Fantasticks, (as well as playing El Gallo in that production), and the huge and partly professional Hello Dolly! 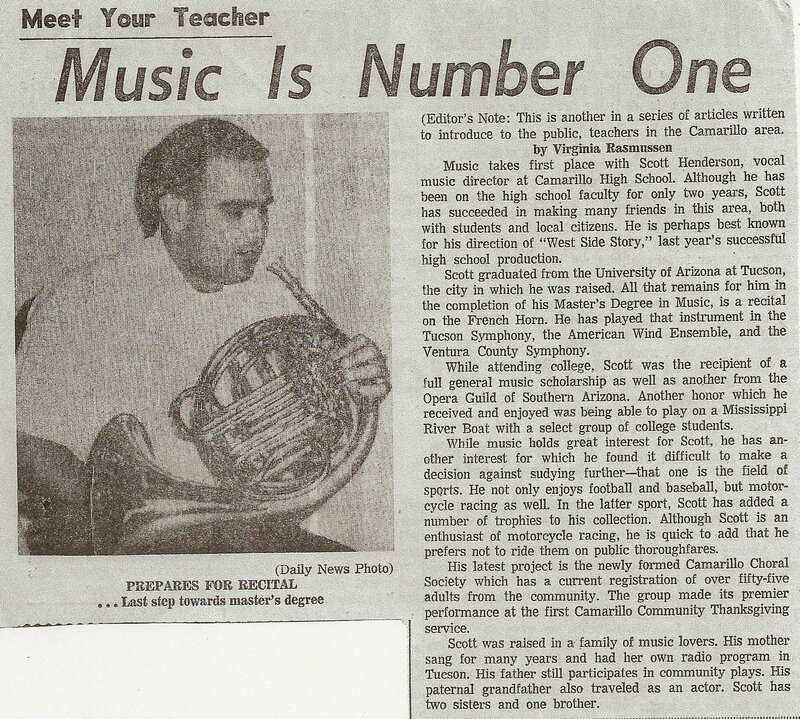 The title of the newspaper article got it right…For Scott Henderson music truly was Number One.